This idea was spinning in my head for several months now: A tour through a part of the USA by car, to photograph in some of the National Parks! Or by other words: Road Trip, Baby! So I was looking from time to time for inexpensive flight tickets and found some a few weeks ago. With my current tickets, I am arriving in Colorado and go back from California. I start my journey in Denver, from there I’m visiting/drive through the States of Colorado, Utah, Nevada and California. I have decided to drive distances of around six hours, which may vary if there are some photo opportunities on my way. Overall I am going to drive a distance of nearly 2700 kilometers (1677 miles). 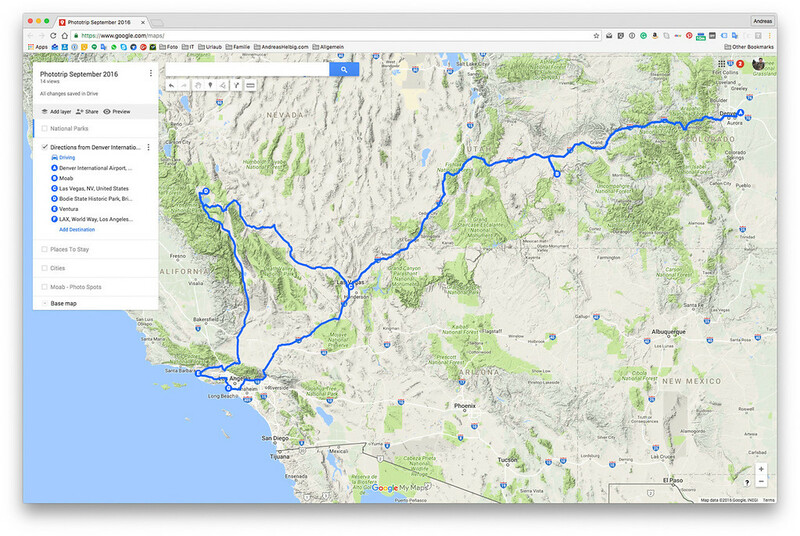 The route will take around 25 hours of driving time. These are the information I got out of Google Maps. How good these are in reality, we will see. As I’m arriving in Denver in the evening, I decided to get a hotel near the airport, to stay for the night and start the next day, hopefully, refreshed to my first destination: Moab in Utah. I think Moab is an ideal spot to start from for the next days because of the National Parks, that are within a short driving distance: Arches, Canyonlands and Deadhorse Point. To have a little more time to relax while shooting some images (and there are plenty of attractive locations), I am planning to stay for two nights in Moab. One might argue that this is way too short, but remember this is my first trip of this kind, and I hope that some of the experiences I make, will be useful for further excursions. Or I may conclude, that there won’t be a vacation like this again. Either way, I will post my final thoughts here, after I return. After spending two days in Moab, I start another stage to Las Vegas. I have chosen Las Vegas to cut the way up to Lee Vining/Yosemite about in half. So the driving will not be too exhausting, so I have the option to pull over and snap some photos. For me, the area around Lee Vining will provide two interesting photo opportunities. One is Yosemite National Park, the other is the old golddigger town, Bodie. Maybe I will just go to the National Park, but Bodie is on my bucket list for quite a while now. On the other hand, to have a wallpaper of El Capitan on my computer, which I have snapped on my own, would be a plus for Yosemite. I am so indecisive about these two options. Anyway, for both destinations, is Lee Vining a good place to start. Right after leaving Lee Vining and Yosemite, I will straight drive to Ventura, where I will meet my friend Ray (we get to know each other through the Arcanum) and his family. If all turns out well, we go to photograph in the Los Angeles area for the next two days. All in all, a relatively jam-packed week with, hopefully, some nice images for my portfolio as a result.